The first season of Ash vs Evil Dead was nonstop insane mayhem, continuing a story that began 35 years ago in the most rewarding way possible. How could the second season possibly top that? Sam Raimi had the answer: raise the stakes, allow certain characters to evolve, and make everything at least 10 times gorier. Last night’s finale wrapped up this season’s overarching homecoming theme by bringing Ash back to the cabin where it all began—again. It’s the same place where season one ended, but this time the circumstances were quite a bit different. Instead of Ash, Kelly, and Pablo making the trek to return the Necronomicon and defeat Ruby (which isn’t at all how things turned out), Ash, Kelly, Ruby (now an ally), and Pablo’s bisected corpse finally worked in that Army of Darkness reference we’ve been waiting for, and time-traveled back to 1982. The plan, dreamed up by a very drunk Ash, would be to prevent the younger version of Ash from ever cracking open the cursed book, thus preventing him from becoming a perpetual Deadite target—and saving Pablo’s life several years down the line. But Ash is “El Jefe,” the chosen one, and while changing history is a tough enough task, changing one’s fate is another thing entirely. Ruby and Kelly went from enemies to friends this season. But will it last? One of the things Ash vs Evil Dead does most brilliantly is create supporting characters who are broad enough to fit into Ash’s crazy, cartoonish world—but are also capable of nuance. We saw Ruby, last season’s villain, lose her immortality and, more importantly, shift her perspective on the whole good vs. evil thing after birthing demon spawn that eventually turned against her. Kelly proved herself a more than capable brawler—but also wondered if maybe she should be fighting her own battles rather than just being Ash’s sidekick. Pablo had the hardest time of all, spending all season mentally bound to the Necronomicon, something that he knew he wouldn’t be able to survive. That said, this show is called Ash vs Evil Dead, and the main reason to watch—other than the wonderfully repulsive special effects, and the clever call-outs to the movies that came before the TV show—is Bruce Campbell as Ash. His performance on the series is the perfect blend of a guy who’s seen everything before, and is therefore ready for anything, and yet still manages to be taken by surprise every time. (Never untie anyone or anything that’s trapped in the cabin basement, Ash—you should know that by now!) And though he acts like a blowhard most of the time, he’s also no dummy, and he’s constantly being underestimated. This quality was used to great effect in episode seven, “Delusion,” which spent the entire time trying to convince the viewer that Ash had been institutionalized for 35 years after killing all his friends at the cabin. 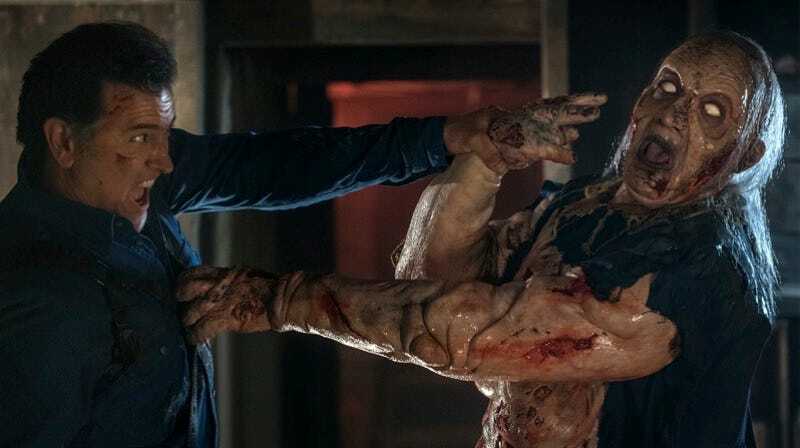 Though it was rather obviously an illusion orchestrated by “Bill,” the skin-stealing demon, it was the first time Ash vs Evil Dead has slowed its traditionally breakneck pace and focused itself on one specific high concept. Amid a sea of other stakes-raising moments this season—introducing (and then killing off) Ash’s father, in the form of a perfectly-cast Lee Majors; the Delta 88 becoming possessed; Ash fighting an undead human colon; Ash regaining his hand, only to lose it again—it was an interesting experiment that might not have totally worked, but proved the show is interested in more than just rivers of blood and bile. That’s not to say it didn’t spend an awful lot of time dreaming up plenty of new and disgusting scenarios that have rightfully become the show’s trademark. I thought the colon scene mentioned above was going to be my top pick for season two’s most-repulsive moment, but then I saw Deadite Henrietta forcibly breast-feed our squirming hero—which made me both shriek in horror, and thank the TV gods that there’ll be a season three of Ash vs Evil Dead. What could possibly top that nightmarish sight? No doubt we’re going to find out when the show returns.